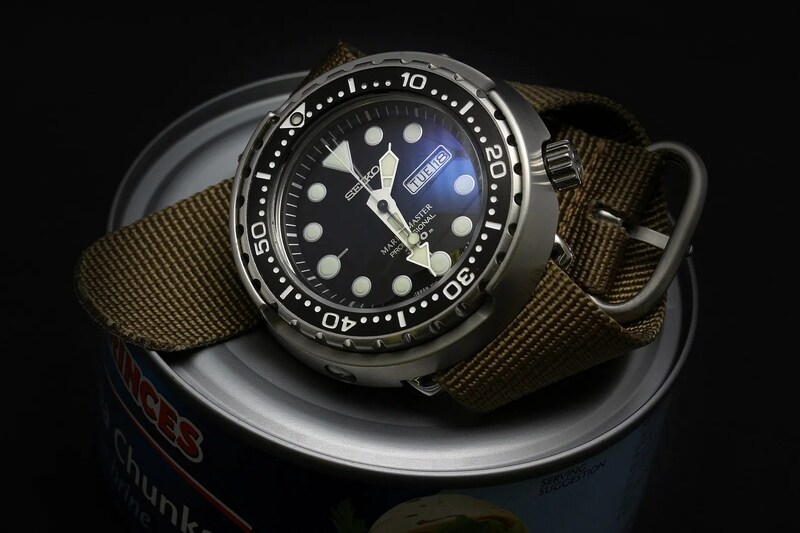 The Tuna is possibly the strangest watch I’ve come across in the last few years, or indeed ever. First off, it’s fugly… in fact, it was the watch I least understood when I first came to know it and it takes a degree of persistence to see underneath the weird shape and ungainly dimensions. When you do, though, it becomes a thing of beauty, transformed by it’s own utilitarian nature into the perfect marriage of form and function. Secondly, it’s size is deceptive to those who haven’t worn one, because at 48mm many would think you need a massive wrist to carry it off. In fact, with lugs that remind me of the undersized hands of a Tyrannosaurus Rex, it sits really comfortably on a sub-7″ wrist and is therefore wearable by all but the slimmest/smallest of people. Finally, it’s quartz. However, there’s always room for a grab & go in any collection, and the fact that it’s powered by a battery shouldn’t t you off. In fact, I see it as an advantage in many ways (albeit not a substitute for the mechanical wonders that make up the rest of my collection). I sold an SBBN007 about a year ago, and amazingly – with all the high-end pieces that have slipped through my fingers since – it’s the watch that I’ve most missed and most wanted back. I’ve been scouring the sales listings on SCWF literally for months and must have exchanged about a hundred emails with members over there; however, I was after a mint SBBN015 with it’s black bezel, it’s brushed (as opposed to blasted) shroud, and it’s dial that now proudly states “Marinemaster” once again, and I simply couldn’t find one at the right price. However, just as I was giving up and thinking I’d have to bite the bullet and buy new – with the associated import charges and potential for packages to go astray – the perfect watch appeared yesterday on TZ-UK and like a big cat hunting it’s prey I pounced!!! In fact, I only just made it, but here it is, complete with an upgraded sapphire crystal, a fresh MOT and battery and some new shroud screws. Anyone thinking about trying one of these beasts – stop thinking and buy one. You couldn’t possibly be disappointed.